Blooming Rose Musings: The Question Is...Is It Pretty or Pretty Ugly? The weather in Malibu this past weekend could be described as pea soup fog. large it is. I mean, really use your imagination! The yacht has been teasing the beach goers in Malibu and is the talk of the area. “A” and it is huge. of how large the “boat” really is. The fog did not stop the surfers from going out to say hello. you can get a better idea of what it looks like on a pretty day. The little boats that are next to the large "boat" are really very good size yachts!!! They just look small because of the size of the huge Russian yacht. high powered jet pool for laps that can be switched from salt to fresh water. white sting-ray hides, while another is covered in hand stitched calf's leather. Did I mention it costs $500,000 to just fill the fuel tank? Did I mention it has a heliport? "A crew of tactical yacht cleaners could be seen repelling down one side of the sea ship like a scene out of a James Bond film as local surfers and paddle boarders gazed at the massive submarine-like vessel in awe. 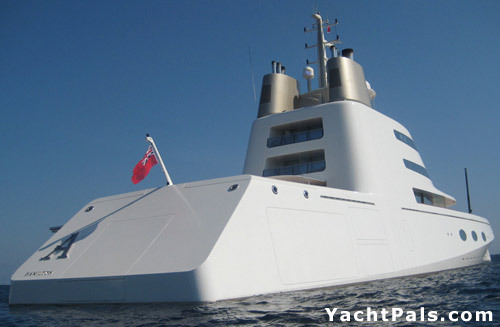 The yacht costs over $20 million per year to maintain and filling the tank with fuel will cost more than $500,000. The ship's two main landing boats are mini-yachts, stretching 36 feet each with plush interiors and costing more than $1 million each. Features include; 23,600 square feet of living space, an all-white, 2,583-square-foot master suite wrapped in bomb-proof, 44-milimeter glass, bomb-proof wrap-around glass encasing the master suite, hydraulic gangways, transom door in the rear of the boat, which swings with open to become a swim deck, numerous garages to store additional vessels. 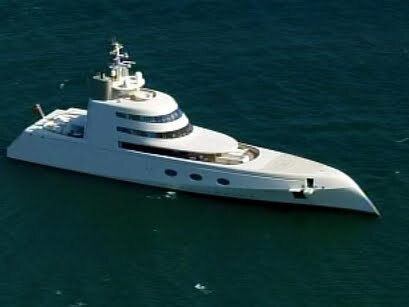 Like many Russian-owned yachts, the "A" is highly secure. Its rounded exterior and knife-like hull make it difficult for intruders to board. Numerous security cameras and more than a dozen exterior cameras fitted with motion-detection systems and a night-vision infrared system. Designed to outrun threats: Twin, high-speed diesel engines deliver 24,000 horsepower and push the 5,959-gross-ton ship to 24 knots, roughly a third faster than most boats its size. The boat is stabilized by fiber-optic gyroscopes and four giant motorized flaps. The "A" has a crew of between 35 to 37 people, including stewards and stewardesses, mechanical engineers, security staff, housekeepers, deck hands, galley crew and chefs. The crew also has specialists for surfing, jet skiing, water skiing and cycling. All of the crew wear Starck-designed uniforms." to have an opinion. How about you? Amazing boat..but such a shame to waste that much $on such a thing when the owner could be helping the needy (especially in Russia)quite frankly that guy who owns it should be ashamed of himself for being so selfish.Sorry it just makes me upset when wealthy people have to flaunt and 3,000,000 just for a yacht is sickening.Im probably the only one whos NOT impressed. UGH..sorry for the rant!LOL..I love the pics of the surfers and the ocean though ;).. I don't think it's as nice looking as a traditional yacht. And I think it's overkill to spend that much on a yacht. There are so many better ways to spend your money. The water and the sky are pretty but the yacht is pretty UGLY! I can think of 500,000 better ways of spending all that money he has than on a tank of gas! I recently watched a news program that featured Andrey. It was pretty interesting to learn how he made all his billions...with a big B. It is hard to imagine how large this ship must be - 23,000 square feet of living space...wow. It does look very James Bondish...in my opinion - it is ugly. Pretty Ugly that is!!! p.s. even if it was a gray day - loved your photo of the surfers. Malibu is awesome. The size of that thing is pretty amazing. The amount of money involved with it is kind of sad when there are so many people living in poverty. But then again, who knows, maybe this guy helps those in need as well, right? I'd have to say 'pretty ugly'. I like my boats a little smaller, with sails and character. Hmmmm...it looks like the cross between a cruise ship and a submarine. Totally outlandish and ostentacious, but that is how some billionaires like to be, especially new ones. Doesn't it make you wonder why he has to have everything "bomb proof"? I like my quiet life better ...lol! PS: Thanks for your nice comments--I really appreciate them! Interesting. I kind of like it, however, I would like it even more if it were more environmentally friendly. Calf hides and Stingray skins on the walls? That's just over indulgent and careless. I can't help but wonder what this man does for a living. Oil, perhaps? This is very intriguing. I am a less is more girl, so I vote for ugly. Boats are beautiful, but this one looks a little greedy, no? On a brighter note, the surf and the ocean is stunning even with fog. Definitely not "Pretty", it's GORGEOUS! and fascinating!!! I wonder if those who think it is ugly would refuse an invitation to board? There is really nothing like living in high style on the high seas.